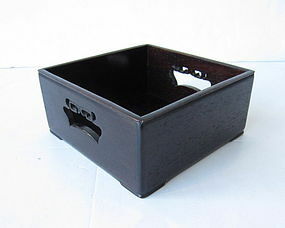 A finely crafted Japanese tobacco tray (known in Japanese as Tabako Bon) which is often seen being used in tea ceremony. Karaki is a term used to describe the foreign hardwoods that were imported from China and used to make furniture and accessories for the home. 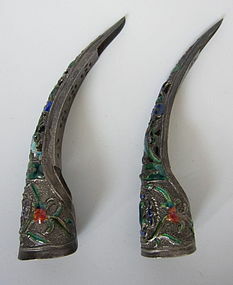 Age: 19th-20th century. 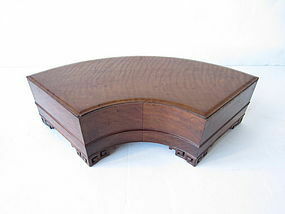 Size: Height: 3.25" Width: 6.75" Length: 6.75"
A Chinese hardwood container/ box formed in the shape of a fan. 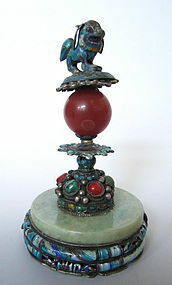 The base is fitted with distinct Chinese geometric scrolling motifs often seen in Chinese wood carvings and architecture. The fan design is also often seen in Chinese art especially within the literati tradition. Age: Republic Period. 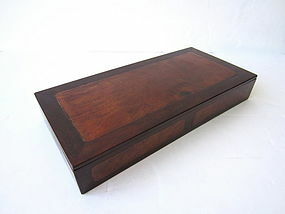 Size: Height" 5" Length: 18" Width: 9"
A finely done Chinese hardwood box with burlwood square inlaid sections on the side. The box inside is covered with a fabric cushioned interior and partitioned to put small objects inside. 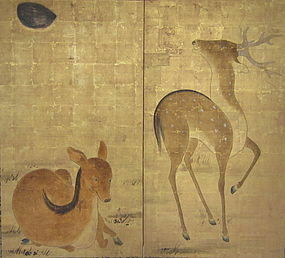 Size: Height: 2.5" Width: 7.5" Length: 15.5"
Two panel Japanese folding screen with image of two deers set on a grassy meadow-like surrounding with a waxing gibbous moon set on the left panel screen. The simple watercolor appearance, minimalist lines, and motif like appearance of the images are the signature elements seen in most Rinpa School. 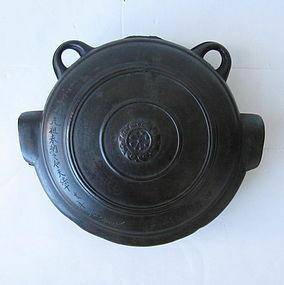 Age: Edo Period (18th-19th century). 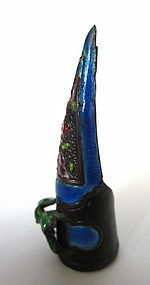 Size: Height: 67.5" Width: 68"